Our auditory system is a masterpiece of design, combining delicate sensory mechanisms with near-instant neural processing to provide us with our sense of hearing. The ear is designed to receive sound and the highly specific way that it does this brings nuance to the way we hear. 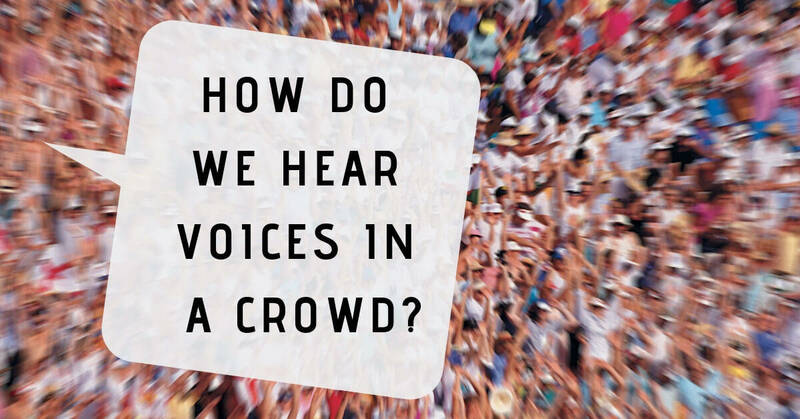 Have you ever been startled to pick out a voice you recognize amidst the din of a crowd? The ability for our hearing to selectively filter sounds has long been one of the hardest aspects of hearing to explain. Once thought to be largely the work of neural processing, new breakthroughs are showing that a thin membrane inside the inner ear may play an even larger role. The key to perceiving sound waves largely rests within the inner ear. The inner ear is full of highly calibrated parts. Liquid-filled tubes are responsible for our sense of balance. The nautilus shell-shaped cochlea is lined with highly attuned hair cells that are stimulated when the vibration of a sound wave hits them. It has long been understood that these fragile hair cells do much of the heavy lifting in the auditory system – converting sound wave stimuli into electrical impulses for the brain to process. The hair cells are also extremely vulnerable – once a hair cell sustains damage it is permanently out of commission, unable to repair or replace itself. Much permanent hearing loss is based in cumulative damage to hair cells, which can come from infection, loud noise exposure or a host of other causes. Hearing aids are designed specifically to compensate for these gaps in our hearing and loss in the hair cells’ acuity. While modern hearing aids restore a breadth to the frequencies a person can hear, many hearing aids are challenged by the problem of selective hearing. Navigating noisy and complex sound environments relies on our ability to focus on important and relevant sounds while pushing aside other sounds as “background noise”. Mimicking the auditory systems natural ability to filter environmental noise has long been the cutting edge of hearing aid technology. Now, a new research breakthrough may open up the way we hear. While science has long recognized the basilar membrane as the structure in the inner ear where hair cells are positioned. New attention is now being given to a gel-like membrane and tiny pores that are part of the sidewalls of the cochlea, the tectorial membrane. Discovered in 2007, understanding the role of the tectorial membrane is just now coming into focus. It is now believed that the tectorial membrane is a key component in how we filter important sounds from those less relevant. The basilar membrane is positioned in the ear to catch sound waves oscillating vertically, while the tectorial membrane is located so it absorbs and bounces sound waves side-to-side. Relying on tiny sensitive pores and a thin viscous gel, both measured in nanometers of thickness, these structures help deliver complex environmental sound filtering to the hair cells. Replicating the way our hearing naturally filters background noise was long thought to be a complex automatic neural response. While part of this appears to be true, the role of the tectorial membrane is now believed to act as an important “first pass” filtering irrelevant noise so neural response time can be quickened. Researchers have been delving into the role of the sensitive pores in the membrane. In studies within mice populations, pore width was strongly related to response time. While larger pores make hearing more sensitive to frequencies and smaller pores decrease sensitivity, the fastest response times surprisingly belonged to mice whose pore size was actually somewhere in the middle. Over-sensitivity to frequencies was found to increase neural processing with too much information, while under-sensitivity made the neural response scramble to decipher incomplete information. Perhaps simulating the role of the tectorial membrane in hearing will unlock the next generation of hearing technology as the importance and mechanics of preemptive noise filtering is better understood. In the past few decades, digital technology has brought hearing aids into the highly nuanced sound processors they are today, and they help millions of Americans effectively manage their hearing loss. With a better understanding of auditory mechanics, advancements in treating hearing loss and providing a rich, natural sense of sound seem ever nearer on the horizon. If you are experiencing changes in your hearing, it is important to take a hearing test. At Roseville Diagnostic Hearing Center, we provide comprehensive hearing services and treatment for hearing loss. Contact us today to schedule an appointment!